Miami Heat star Dwyane Wade shared his support publicly for his 11-year-old son, who appeared Sunday at the annual Miami Beach Pride march. 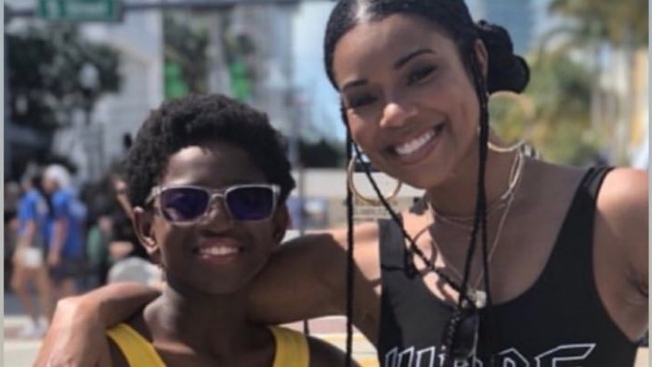 “We support each other with Pride,” Wade wrote on Instagram over a photo of his son, Zion, who appeared with his stepmom, actress Gabrielle Union. Over another image, Wade, who was in Toronto for an NBA game Sunday, wrote, “Zion had his on [sic] cheering section today. Wish i was there to see you smile kid!” He included a rainbow pride flag emoji on the post. Zion and his stepmom were on a float during Sunday's LGBTQ pride festival. Other family members, including his big brother, Zaire, 17, and baby sister, Kaavia, were also at the event. There was an outpouring of support on social media after the NBA star's posts Sunday.